There is a belief that if one did not make a kiddush for the birth of his daughter and that woman is having a hard time finding a shidduch, then they should make a kiddush and it will help. I know from a halachic standpoint there isn't any obligation to make a kiddush, so where did this idea come from? The Rav of Congregation Ahavas Israel, Passaic, NJ debunks the legend about this story here (edited). So the idea is a made-up story. Rabbi Yaakov Yisrael Kanievsky, known as The Steipler (1899–1985) was reported to have told a father of a woman who was having difficulty in finding a shidduch that the reason she was experiencing such difficulty was the fact that upon her birth her father failed to make a kiddush in her honor. 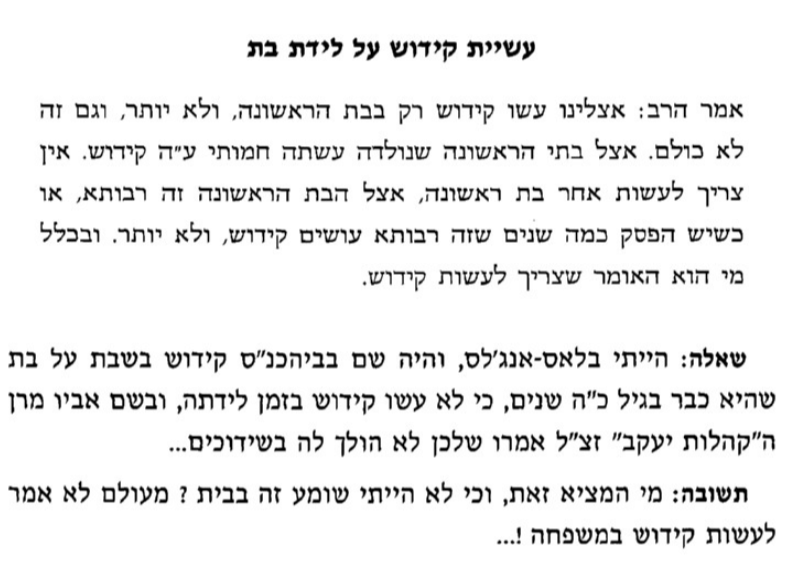 As brochos are traditionally bestowed upon the new born baby girl for her to grow and marry at the kiddush, since the father did not have a kiddush in her honor no brochus were bestowed and therefore she is now suffering with not finding her ‘bashert’. This Shtetl Legend appears in Jewish story books and I myself was present at a Kiddush where a Rabbi related the story. Not the answer you're looking for? Browse other questions tagged sources-mekorot minhag shidduchim-dating .